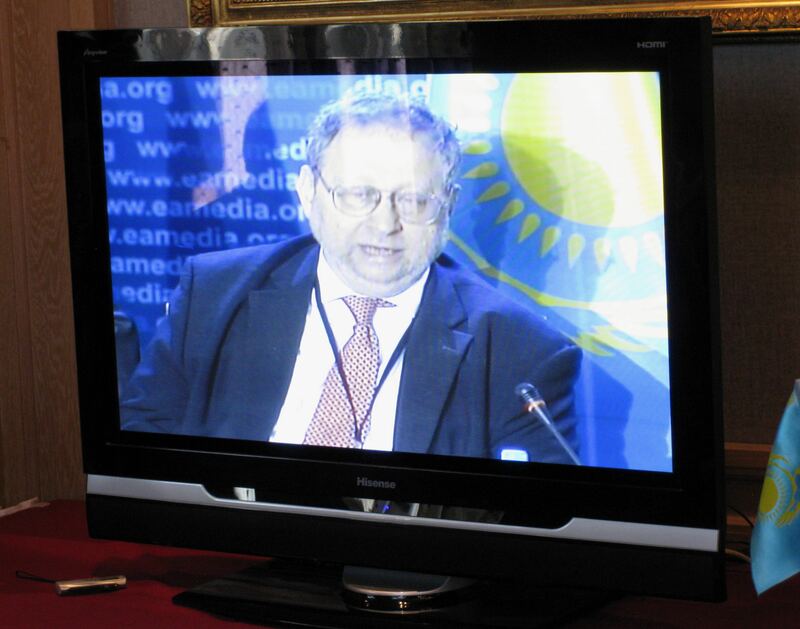 Danny Schechter speaking at the 2009 Eurasian Media Forum in Almaty, Kazakhstan. 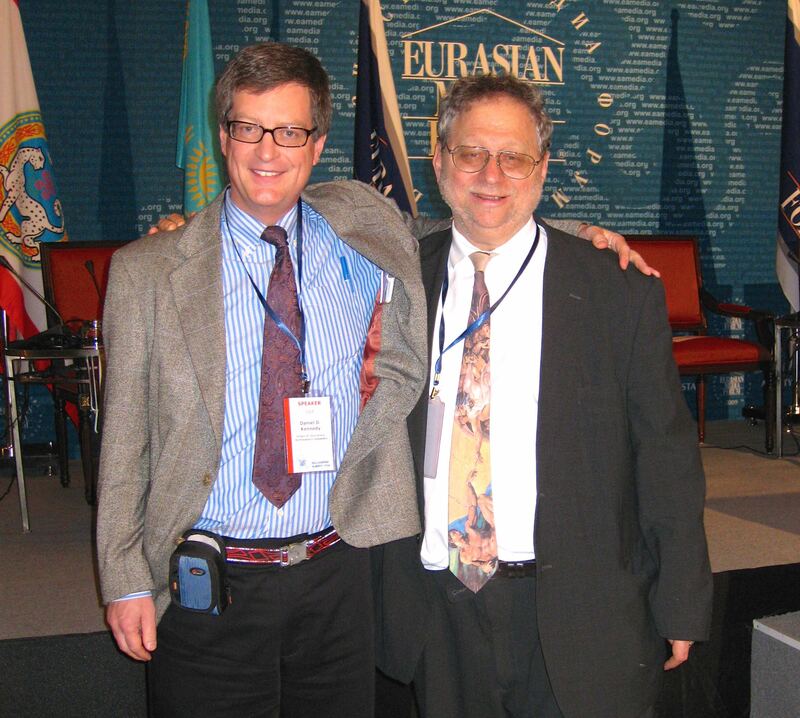 One of my proudest moments as a journalist took place in Almaty, Kazakhstan, in the spring of 2009, when Danny Schechter and I both spoke out on behalf of Yevgeniya Plakhina, a young reporter who was fighting for freedom of speech on the Internet. Danny and I were in Almaty to speak at the Eurasian Media Forum, an annual gathering of journalists and academics that is essentially sponsored by the government of President Nursultan Nazarbayev. Danny died of pancreatic cancer in New York on Thursday at the age of 72. The news that Danny was gone hit me hard, as it did a lot of people I know. He was someone I had admired since I was a teenager and he was the “News Dissector” on WBCN Radio in Boston. Listening to Danny and reading alternative weeklies like The Boston Phoenix and The Real Paper were what led me to pursue a career in journalism. We weren’t especially close, but I considered him a friend. I interviewed him on occasion and reviewed a few of his books. (Here is an index of the posts I wrote about him for this blog.) In reading some of the tributes to him on Facebook last night, he seemed David Carr-like in how many lives he touched. He was certainly Carr-like in his energy, fearlessness and kindness toward others. You can read all about his career in this obituary by Don Hazen at AlterNet. Schechter was, among many other things, perhaps the leading Western journalist in reporting on South Africa and Nelson Mandela. Which leads to another story about Danny. Danny (right) and I in Almaty, Kazakhstan. Back to Kazakhstan. It was because of Danny that I was invited to speak at the Eurasian Media Forum — he’d attended previous forums, and he recommended me to moderate one panel and participate in another. It was what you might call a semi-legitimate event, held, it seemed, to bolster the image of the president’s daughter, Dariga Nazarbayeva, who is in charge of the forum every year. Some of the journalists who attended struck me as nauseatingly obsequious to their hosts, but not Danny. Taking his cheerful defiance as my inspiration, I left the hotel (something that was not encouraged by the organizers) to interview Adil Nurmakov, an editor for Global Voices Online and a member of the political opposition. Danny’s father, Jerry, died just six years ago at the age of 90. 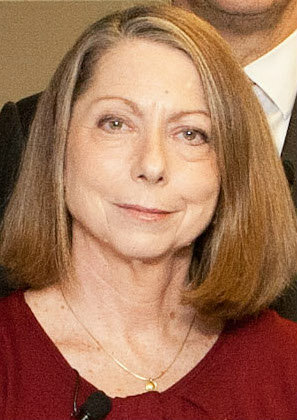 Unlike Jerry Schechter, Danny was not granted the gift of longevity. But he packed a lot of living into his 72 years and touched many lives. Today my heart goes out to his family and friends, including his longtime business partner, Rory O’Connor. Danny Schechter was a giant of journalism and of progressive politics, demonstrating that the two could be combined with passion and integrity. It’s hard to believe that he’s gone. This article has been reposted at WGBHNews.org and Common Dreams. Is this a new golden age of journalism? It all depends on who’s getting the gold. For consumers of news, these are the best of times. Thanks to the Internet, we are awash in quality journalism, from longstanding bastions of excellence such as The New York Times and The Guardian to start-ups that are rising above their disreputable roots such as BuzzFeed and Vice News. For producers of news, though, the challenge is to find new ways of paying for journalism at a time when advertising appears to be in terminal decline. Little wonder that for every fledgling enterprise like Circa, which generates slick digests of other people’s journalism on the theory that that’s what mobile readers want, you have formerly short-attention-span sites like BuzzFeed and Politico retooling themselves to offer serious, in-depth reporting. That Rose-colored assessment brought a withering retort from Andrew Leonard of Salon, who complained that Rose never even mentioned the difficulties of paying for all that wonderful journalism. It’s tempting to try to find a moral dimension to newspapers’ collapse, but there isn’t one. All that’s happened is advertisers are leaving, classifieds first, inserts last. 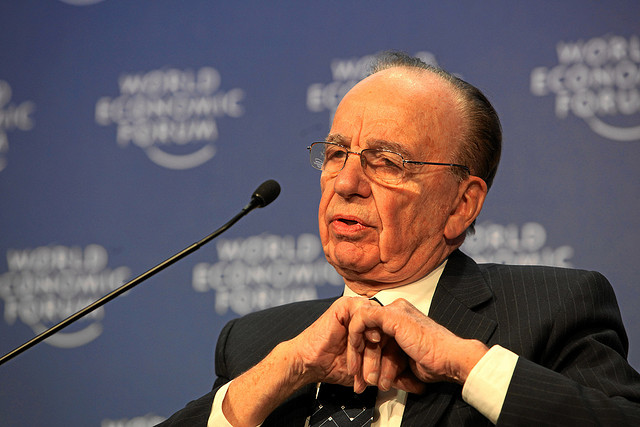 Business is business; the advertisers never had a stake in keeping the newsroom open in the first place. There’s no question that print will eventually go away, though it may survive for a few more years as a high-priced specialty product for people who are willing to pay for it. The dilemma of how to pay for journalism, though, is not going away. Free online news supported solely by advertising has not proven to be a reliable business model, although there are exceptions, including a few well-managed hyperlocals, like The Batavian in western New York, and sites that draw enormous audiences while employing very few people, like The Huffington Post. Digital paywalls that require users to pay up after reading a certain number of articles have helped bolster the bottom lines of many newspapers, including The Boston Globe. But very few have been able to generate a significant amount of revenue from paywalls, with The New York Times being a notable exception. 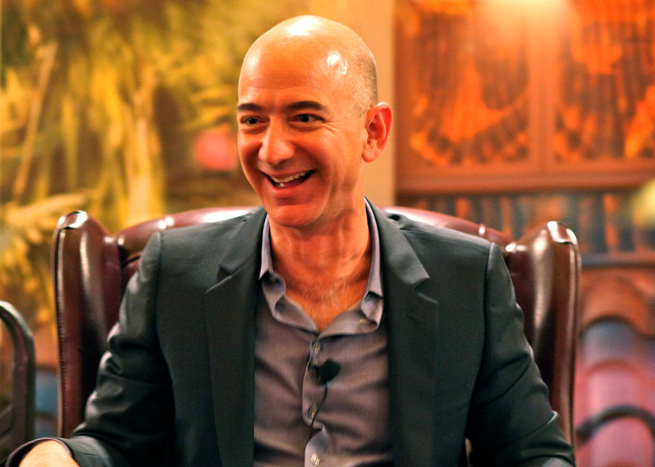 It may turn out that the most reliable path for journalism in the digital age is the nonprofit model, with foundations, wealthy individuals and small donors picking up the tab. It’s a model that has worked well for public television and radio, and that is currently supporting online news organizations both large (ProPublica) and small (the New Haven Independent). But nonprofits are hardly a panacea. The pool of nonprofit money available for journalism is finite, and in any case the IRS has made it difficult for news organizations to take advantage of nonprofit status, as I wrote for The Huffington Post in 2013. Journalism has never been free. Someone has always paid for it, whether it was department stores taking out ads in the Sunday paper or employers buying up pages and pages of help-wanted ads in the classifieds. Today, the most pressing question for journalists isn’t whether we are living in another golden age. Rather it’s something much blunter: Who will pay?